This clump forming perennial is found naturally in open grassland. It has tall sword-shaped green foliage. 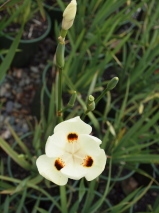 Tall stems of large showy pale yellow iris-like flowers with three large chocolate coloured spots, through the spring and summer. Tolerates sunny dry sites and poor soil. Avoid cold frosty sites and sites that get wet in winter. Provides a strong vertical element in the garden. Hardy.